Notice and agenda filed in the office of the City Clerk and posted at City Hall at 4:45 p.m. on Friday, June 1, 2012. A. Approval of June # 1 Payroll in the amount of $41,103.98. B. Approval of Claims in the amount of $20,375.95. C. Approval of Minutes from May 21, 2012 Regular Meeting. D. Approval of Budget Supplemental in the amount of $323.76-Revenue Rescue Fire Department. E. Approval of Budget Supplemental in the amount of $1,210.89-Seat Belt Safety Grant Police Department. F. Approval of Budget Supplemental in the amount of $1,000 for donation for purchase of 2 stun guns Police Department. G. Approval of Cemetery Deed for Jodi Sanow, 1 space. 7. 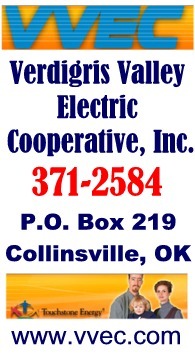 Discussion and possible action to approve contract agreement between the City of Collinsville and Retail Attractions, LLC. -- Approved, renewed for another year with Ricky Hayes' company for economic development (primarily retail business solication) for Collinsville. Hayes discussed Collinsvile (and associated Highway 169 north trade area) demographics and pros and cons of what might attract national retail to locate here. Other than on-going attempt to draw Walmart here, Hayes would not metion specific retailers but mentioned potential types of businesses with interest in west, east and downtown locations. No contract specifics were discussed tonight but believe $30,000 was budgeted by the city for this contract next year. Retail Attractions currently works for 22 communities. * CDBG grant application turned in last Friday (competing with 3 other cities) hoping to get ~$69 for drainage issues near the post office). 10. New Business (business which was not foreseen prior to the posting of this agenda.) -- Herb Weaver mentioned several citizen concerns he had received requesting a stop light at the Highway 169 (north bound) exit to !46th St. N.
A. Approval of June # 1 Payroll in the amount of $27,707.03. B. Approval of Claims in the amount of $38,304.43.